We always welcome new members to the Harbord Bowling Club. The Harbord Bowling Club is a leading club for Social and Competition Bowls on the Northern Beaches of Sydney, holding social bowls 3 days a week nearly every day whilst holding prestige championship events each year such as the GREAT NORTHERN 2 BOWLS OPEN TRIPLES AND REMEMBRANCE DAY 3 BOWLS OPEN PAIRS. The Club has bowls coaches who will introduce you to the green, show you how to bowl and explain the rules of the game – free of charge! 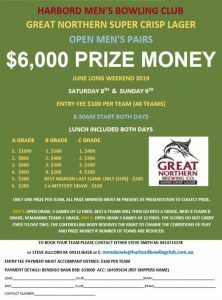 No matching events listed under Men's Bowls. Please try viewing the full calendar for a complete list of events. All members participating in Club events must be financial members of the club. The Bowls Secretary must sanction any games to be played before the advertised date. If a date cannot be agreed upon by either party, the advertised date will apply. Dispensation may be given to those playing in State or Zone events. Owing to the lack of spare dates for rounds postponed by inclement weather or other reasons, the Match Committee will determine new dates. It may be necessary to play during the evening. In all major Club Championship events, the ruling laid down by the RNSWBA will apply, however, in the Handicap Pairs and Mixed Pairs a substitute may play in the same position as the player he is replacing. Teams are limited to a minimum total handicap of ten (10). Minors are eligible to enter as a team. If it rains on the day of play, if 10 ends have been played this will constitute a game. It is the player’s responsibility to see they have a marker. Please note: the losing players are to mark the next round, losers to toss. If you enter a singles championship and draw a bye in the first round, you must be available to mark that first round. The Match Committee reserves the right to alter dates and conditions of play at any time. Player’s Handicaps will be determined by the players Pennant grading for that season or as determined by the Match Committee or Chairman of Selectors. If the temperature reaches 35 degrees players will leave the green after the end is completed for a 30 minute break. The game will continue, if the temperature does not drop a 10 minute break will be called every 30 minutes. The Bowls Office accepts entries for the day up until 11.00am on Tuesdays, Thursdays and Saturdays, and 9.00am Wednesdays and Fridays.